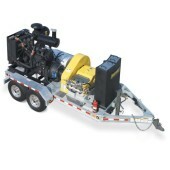 The X-Series water blast units from Jetstream are engineered to outperform and outlast any other units. The new Guardian™ water tank and filter system helps extend system life, while larger filters help extend onsite operating time. Available as a skid or trailer unit, X-Series diesel waterblasters offer a host of features to provide contractors with enhanced performance, superior durability, and unsurpassed operating efficiency. Working pressures from 5,000 to 40,000 psi (350 to 2750 bar) with input power from 150 to 325 hp (112 to 242 kW).